In this arresting memoir about growing up inand ultimately escaping froma strict Hasidic community, Deborah Feldman reveals what life is like trapped within a religious sect that values silence and suffering over individual freedoms. The Satmar sect of Hasidic Judaism is as mysterious as it is intriguing to outsiders. Unorthodox sheds new light on this subculture through one womanâ€™s harrowing tale of repression and self-discovery. Raised in the cloistered world of Brooklynâ€™s Satmar Hasidim, Deborah Feldman struggled as a naturally curious child to make sense of and obey the rigid strictures that governed her daily life. From what she could read to whom she could speak with, virtually every aspect of her identity was tightly controlled. Married at age seventeen to a man she had only met for thirty minutes, and denied a traditional educationsexual or otherwiseshe was unable to consummate the relationship for an entire year. Her resultant debilitating anxiety went undiagnosed and was exacerbated by the public shame of having failed to serve her husband. In exceptional prose, Feldman recalls how stolen moments reading about the empowered literary characters of Jane Austen and Louisa May Alcott helped her to see an alternative way of lifeone she knew she had to seize when, at the age of nineteen, she gave birth to a son and realized that more than just her own future was at stake. 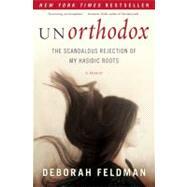 Unorthodox is a captivating odyssey through adversity and a groundbreaking look into Orthodox Jewish culture. Deborah Feldman was raised in the Hasidic community of Satmar in the Williamsburg section of Brooklyn, New York. She attends Sarah Lawrence College and lives in New York City with her son. On the eve of my twenty-fourth birthday I interview my mother. We meet at a vegetarian restaurant in Manhattan, one that announces itself as organic and farm-fresh, and despite my recent penchant for all things pork and shellfish, I am looking forward to the simplicity the meal promises. The waiter who serves us is conspicuously gentile-looking, with scruffy blond hair and big blue eyes. He treats us like royalty because we are on the Upper East Side and are prepared to shell out a hundred bucks for a lunch consisting largely of vegetables. I think it is ironic that he doesn’t know that the two of us are outsiders, that he automatically takes our existence for granted. I never thought this day would come. Before we met, I told my mother that I had some questions for her. Although we’ve spent more time together over the past year than we did in all my teenage years put together, thus far I’ve mostly avoided talking about the past. Perhaps I did not want to know. Maybe I didn’t want to find out that whatever information had been fed to me about my mother was wrong, or maybe I didn’t want to accept that it was right. Still, publishing my life story calls for scrupulous honesty, and not just my own. A year ago to this date I left the Hasidic community for good. I am twenty-four and I still have my whole life ahead of me. My son’s future is chock-full of possibilities. I feel as if I have made it to the starting line of a race just in time to hear the gun go off. Looking at my mother, I understand that there might be similarities between us, but the differences are more glaringly obvious. She was older when she left, and she didn’t take me with her. Her journey speaks more of a struggle for security than happiness. Our dreams hover above us like clouds, and mine seem bigger and fluffier than her wispy strip of cirrus high in a winter sky. As far back as I can remember, I have always wanted everything from life, everything it can possibly give me. This desire separates me from people who are willing to settle for less. I cannot even comprehend how people’s desires can be small, their ambitions narrow and limited, when the possibilities are so endless. I do not know my mother well enough to understand her dreams; for all I know, they seem big and important to her, and I want to respect that. Surely, for all our differences, there is that thread of common ground, that choice we both made for the better. My mother was born and raised in a German Jewish community in England. While her family was religious, they were not Hasidic. A child of divorce, she describes her young self as troubled, awkward, and unhappy. Her chances of marrying, let alone marrying well, were slim, she tells me. The waiter puts a plate of polenta fries and some black beans in front of her, and she shoves her fork in a fry. When the choice of marrying my father came along, it seemed like a dream, she says between bites. His family was wealthy, and they were desperate to marry him off. He had siblings waiting for him to get engaged so that they could start their own lives. He was twenty-four, unthinkably old for a good Jewish boy, too old to be single. The older they get, the less likely they are to be married off. Rachel, my mother, was my father’s last shot. Everyone in my mother’s life was thrilled for her, she remembers. She would get to go to America! They were offering a beautiful, brand-new apartment, fully furnished. They offered to pay for everything. She would receive beautiful clothes and jewelry. There were many sisters-in-law who were excited to become her friends. “So they were nice to you?” I ask, referring to my aunts and uncles, who, I remember, mostly looked down on me for reasons I could never fully grasp. She saved them all, the younger ones. They were spared the fate of getting older in their singlehood. In the beginning, they were grateful to see their brother married off. Shame is all I can recall of my feelings for my father. When I knew him, he was always shabby and dirty, and his behavior was childlike and inappropriate. I nod. “So in the beginning, they were nice to you. But what happened after?” I remember my aunts talking about my mother behind her back, saying hateful things. I still feel a little sting when someone says something bad about my family, as if I have to defend them. So in the end she had nothing to cling to, my mother. No husband, no family, no home. In college, she would exist, would have purpose, direction. You leave when there’s nothing left to stay for; you go where you can be useful, where people accept you. The waiter comes to the table holding a chocolate brownie with a candle stuck in it. “Happy birthday to you . . . ,” he sings softly, meeting my eyes for a second. I look down, feeling my cheeks redden. “Blow out the candle,” my mother urges, taking out her camera. I want to laugh. I bet the waiter thinks that I’m just like every other birthday girl going out with her mom, and that we do this every year. Would anyone guess that my mother missed most of my birthdays growing up? How can she be so quick to jump back into things? Does it feel natural to her? It certainly doesn’t feel that way to me. After both of us have devoured the brownie, she pauses and wipes her mouth. She says that she wanted to take me with her, but she couldn’t. She had no money. My father’s family threatened to make her life miserable if she tried to take me away. Chaya, the oldest aunt, was the worst, she says. “I would visit you and she would treat me like garbage, like I wasn’t your mother, had never given birth to you. Who gave her the right, when she wasn’t even blood?” Chaya married the family’s oldest son and immediately took control of everything, my mother recalls. She always had to be the boss, arranging everything, asserting her opinions everywhere. And when my mother left my father for good, Chaya took control of me too. She decided that I would live with my grandparents, that I would go to Satmar school, that I would marry a good Satmar boy from a religious family. It was Chaya who, in the end, taught me to take control of my own life, to become iron-fisted like she was, and not let anyone else force me to be unhappy. It was Chaya who convinced Zeidy to talk to the matchmaker, I learned, even though I had only just turned seventeen. In essence, she was my matchmaker; she was the one who decided to whom I was to be married. I’d like to hold her responsible for everything I went through as a result, but I am too wise for that. I know the way of our world, and the way people get swept along in the powerful current of our age-old traditions. Matilda longed for her parents to be good and loving and understanding and honourable and intelligent. The fact that they were none of those things was something she had to put up with. . . . Being very small and very young, the only power Matilda had over anyone in her family was brainpower. My father holds my hand as he fumbles with the keys to the warehouse. The streets are strangely empty and silent in this industrial section of Williamsburg. Above, the stars glow faintly in the night sky; nearby, occasional cars whoosh ghostlike along the expressway. I look down at my patent leather shoes tapping impatiently on the sidewalk and I bite my lip to stop the impulse. I’m grateful to be here. It’s not every week that Tatty takes me with him. One of my father’s many odd jobs is turning the ovens on at Beigel’s kosher bakery when Shabbos is over. Every Jewish business must cease for the duration of the Shabbos, and the law requires that a Jew be the one to set things in motion again. My father easily qualifies for a job with such simple requirements. The gentile laborers are already working when he gets there, preparing the dough, shaping it into rolls and loaves, and when my father walks through the vast warehouse flipping the switches, a humming and whirring sound starts up and builds momentum as we move through the cavernous rooms. This is one of the weeks he takes me with him, and I find it exciting to be surrounded by all this hustle and know that my father is at the center of it, that these people must wait for him to arrive before business can go on as usual. I feel important just knowing that he is important too. The workers nod to him as he passes, smiling even if he is late, and they pat me on the head with powdery, gloved hands. By the time my father is done with the last section, the entire factory is pulsating with the sound of mixing machines and conveyor belts. The cement floor vibrates slightly beneath my feet. I watch the trays slide into the ovens and come out the other end with shiny golden rolls all in a row, as my father makes conversation with the workers while munching on an egg kichel. Bubby loves egg kichel. We always bring her some after our trips to the bakery. In the front room of the warehouse there are shelves stocked with sealed and packed boxes of various baked goods ready to be shipped in the morning, and on our way out, we will take as many as we can carry. There are the famous kosher cupcakes with rainbow sprinkles on top; the loaves of babka, cinnamon- and chocolate-flavored; the seven-layer cake heavy with margarine; the mini black-and-white cookies that I only like to eat the chocolate part from. Whatever my father selects on his way out will get dropped off at my grandparents’ house later, dumped on the dining room table like bounty, and I will get to taste it all. What can measure up to this kind of wealth, the abundance of sweets and confections scattered across a damask tablecloth like goods at an auction? Tonight I will fall easily into sleep with the taste of frosting still in the crevices of my teeth, crumbs melting into the pockets on either side of my mouth. People employ him out of pity, I know. They hire him to drive them around, deliver packages, anything they think he is capable of doing without making mistakes. He doesn’t understand this; he thinks he is performing a valuable service. My father performs many errands, but the only ones he allows me to participate in are the occasional trips to the bakery and the even rarer ones to the airport. The airport trips are more exciting, but they only happen a couple of times a year. I know it’s strange for me to enjoy visiting the airport itself, when I know I will never even get on a plane, but I find it thrilling to stand next to my father as he waits for the person he is supposed to pick up, watching the crowds hurrying to and fro with their luggage squealing loudly behind them, knowing that they are all going somewhere, purposefully. What a marvelous world this is, I think, where birds touch down briefly before magically reappearing at another airport somewhere halfway across the planet. If I had a wish, it would be to always be traveling, from one airport to another. To be freed from the prison of staying still. After my father drops me off at the house, I might not see him again for a while, maybe weeks, unless I run into him on the street, and then I will hide my face and pretend not to see him, so that I don’t get called over and introduced to whomever he is speaking to. I can’t stand the looks of curious pity people give me when they find out I am his daughter. Bubby is the only person who thinks I’m one hundred percent all here. With her you can tell she never questions it. She doesn’t judge people. She never came to conclusions about my father either, but maybe that was just denial. When she tells stories of my father at my age, she paints him as lovably mischievous. He was always too skinny, so she would try anything to get him to eat. Whatever he wanted he got, but he couldn’t leave the table until his plate was empty. One time he tied his chicken drumstick to a piece of string and dangled it out the window to the cats in the yard so he wouldn’t have to stay stuck at the table for hours while everyone was outside playing. When Bubby came back, he showed her his empty plate and she asked, “Where are the bones? You can’t eat the bones too.” That’s how she knew. I wanted to admire my father for his ingenious idea, but my bubble of pride burst when Bubby told me he wasn’t even smart enough to think ahead, to pull the string back up so he could place the freshly gnawed bones back on the plate. At eleven years old, I wished for a more shrewd execution of what could have been an excellent plan. By the time he was a teenager, his innocent mischief was no longer charming. He couldn’t sit still in yeshiva, so Zeidy sent him to Gershom Feldman’s boot camp in upstate New York, where they ran a yeshiva for troublesome kids—like regular yeshiva, only with beatings if you misbehaved. It didn’t cure my father’s strange behavior. Perhaps in a child, eccentricity is more easily forgiven. But who can explain an adult who hoards cake for months, until the smell of mold is unbearable? Who can explain the row of bottles in the refrigerator, each containing the pink liquid antibiotics that children take, that my father insists on imbibing every day for some invisible illness that no doctor can detect? Bubby still tries to take care of him. She cooks beef especially for him, even though Zeidy doesn’t eat beef since the scandal ten years ago, when some of the kosher beef turned out to be not kosher after all. Bubby still cooks for all her sons, even the married ones. They have wives now to take care of them, but they still come by for dinner, and Bubby acts like it’s the most natural thing in the world. At ten o’clock each night she wipes down the kitchen counters and jokingly declares the “restaurant” closed. I eat here too, and I even sleep here most of the time, because my mother never seems to be around anymore and my father can’t be depended on to take care of me. When I was very little, I remember my mother used to read books to me before I fell asleep, stories about hungry caterpillars and Clifford the big red dog. In Bubby’s house the only books around are prayer books. Before I go to sleep, I say the Shema prayer. I’d like to read books again, because those are the only happy memories I have, of being read to, but my English isn’t very good, and I have no way of obtaining books on my own. So instead I nourish myself with cupcakes from Beigel’s, and egg kichel. Bubby takes such particular pleasure and excitement in food that I can’t help but get caught up in her enthusiasm. Bubby’s kitchen is like the center of the world. It is where everyone congregates to chatter and gossip, while Bubby pours ingredients into the electric mixer or stirs the ever-present pots on the stove. Somber talks take place with Zeidy behind closed doors, but good news is always shared in the kitchen. Ever since I can remember, I’ve always gravitated toward the small white-tiled room, often fogged with cooking vapors. As a toddler I crawled down the one flight of stairs from our apartment on the third floor to Bubby’s kitchen on the second floor, edging cautiously down each linoleum-covered step with my chubby baby legs, hoping that a reward of cherry-flavored Jell-O was in it for me at the end of my labors. It is in this kitchen that I have always felt safe. From what, I cannot articulate, except to say that in the kitchen I did not feel that familiar sense of being lost in a strange land, where no one knew who I was or what language I spoke. In the kitchen I felt like I had reached the place from which I came, and I never wanted to be pulled back into the chaos again. I usually curl up on the little leather stool stashed between the table and the fridge and watch as Bubby mixes the batter for chocolate cake, waiting for the spatula that I always get to lick clean. Before Shabbos, Bubby stuffs whole beef livers into the meat grinder with a wooden pestle, adding handfuls of caramelized onions every so often and holding a bowl underneath to catch the creamy chopped liver oozing out of the grinder. Some mornings she mixes premium-quality Dutch cocoa and whole milk in a pot and boils it to a bubble, serving up a rich, dark hot chocolate that I sweeten with lumps of sugar. Her scrambled eggs are swathed in buttery slicks; her boondash, or the Hungarian version of French toast, is always crisp and perfectly browned. I like watching her prepare food even more than I like eating it. I love how the house fills with the scents; they travel slowly through the railroad-style apartment, entering each room consecutively like a delicate train of smells. I wake up in the morning in my little room all the way at the other end of the house and sniff expectantly, trying to guess what Bubby is working on that day. She always wakes up early, and there are always food preparations under way by the time I open my eyes. If Zeidy isn’t home, Bubby sings. She hums wordless tunes in her thin, feathery voice as she skillfully whisks a fluffy tower of meringue in a shiny steel bowl. This one is a Viennese waltz, she tells me, or a Hungarian rhapsody. Tunes from her childhood, she says, her memories of Budapest. When Zeidy comes home, she stops the humming. I know women are not allowed to sing, but in front of family it is permitted. Still, Zeidy encourages singing only on Shabbos. Since the Temple was destroyed, he says, we shouldn’t sing or listen to music unless it’s a special occasion. Sometimes Bubby takes the old tape recorder that my father gave me and plays the cassette of my cousin’s wedding music over and over, at a low volume so she can hear if someone’s coming. She shuts it off at the merest sound of creaking in the hallway. Her father was a Kohain, she reminds me. He could trace his legacy all the way back to the Temple priests. Kohains are renowned for having beautiful, deep voices. Zeidy can’t carry a tune for the life of him, but he loves to sing the songs his father used to sing back in Europe, the traditional Shabbos melodies that his flat voice distorts into tuneless rambles. Bubby shakes her head and smiles at his attempts. She’s long since given up trying to sing along. Zeidy makes everyone sing out of tune, his loud, flat warblings drowning out everyone else’s voice until a melody becomes impossible to distinguish. Only one of her sons inherited her voice, Bubby says. The rest are like their father. I tell her I was chosen for a solo in a school choir, that maybe I did inherit my strong, clear voice from her family. I want her to be proud of me. Bubby never asks how I’m doing in school. She doesn’t concern herself with my activities. It’s almost as if she doesn’t really want to get to know me for who I truly am. She’s like that with everyone. I think it’s because her whole family was murdered in the concentration camps, and she no longer has the energy to connect emotionally with people. All she ever worries about is if I’m eating enough. Enough slices of rye bread spread thickly with butter, enough plates of hearty vegetable soup, enough squares of moist, glistening apple strudel. It seems as if Bubby is constantly putting food in front of me, even at the most inappropriate of moments. Taste this roast turkey at breakfast. Try this coleslaw at midnight. Whatever’s cooking, that’s what’s available. There are no bags of potato chips in the pantry, no boxes of cereal even. Everything that is served in Bubby’s house is freshly made from scratch. Zeidy is the one who asks me about school, but mostly just to check if I’m behaving myself. He only wants to hear that I’m conducting myself properly so no one will say he has a disobedient granddaughter. Last week before Yom Kippur he advised me to repent so I could start the year anew, magically transformed into a quiet, God-fearing young girl. It was my first fast; although according to the Torah I become a woman at age twelve, girls start fasting at eleven just to try it out. There is a whole world of new rules in store for me when I cross the bridge from childhood to adulthood. This next year is a sort of practice run. There are only a few days left before the next holiday, Sukkot. Zeidy needs me to help build the sukkah, the little wooden hut we will all spend eight days eating inside. To lay the bamboo roof, he needs someone to hand him each stick as he perches on top of the ladder, rolling the heavy rods into place on top of the freshly nailed beams. The dowels clatter loudly as they fall into place. Somehow I always end up with this job, which can get boring after hours of standing at the foot of the ladder, passing each individual rod into Zeidy’s waiting hands. Still, I like feeling useful. Even though the rods are at least ten years old and have been stored in the cellar all year, they smell fresh and sweet. I roll them back and forth between my palms, and the surface feels cool to the touch, polished to a sheen by years of use. Zeidy lifts each one up slowly and deliberately. There aren’t many domestic tasks that Zeidy is willing to take on, but any form of work related to the preparation for the holidays he makes time for. Sukkot is one of my favorites, since it is spent outdoors in crisp fall weather. As the days begin to taper, I soak up every last remnant of sunshine on Bubby’s porch, even if I have to wrap myself in multiple layers of sweaters to keep off the chill. I lie on a bed arranged from three wooden chairs, tilting my face up to the sun that falls haphazardly through the narrow alley between a cluster of back-to-back brownstone tenements. There is nothing more soothing than the feeling of a pale autumn sun on my skin, and I linger until the rays peer weakly above a bleak, dusty horizon. Sukkot is a long holiday, but it has four days in the middle of it that are somewhat nonceremonious. There are no laws about driving or spending money on those days, called Chol Hamoed, and they are generally spent like any other weekday, except that no work is allowed, and so most people go on family trips. My cousins always go somewhere on Chol Hamoed, and I’m confident that I will end up tagging along with some of them. Last year we went to Coney Island. This year, Mimi says we will go ice-skating in the park. Mimi is one of the few cousins who are nice to me. I think it’s because her father is divorced. Now her mother is married to some other man who’s not in our family, but Mimi still comes to Bubby’s house a lot to see her father, my uncle Sinai. Sometimes I think our family is divided in half, with the problems on one side and the perfect people on the other. Only the ones with problems will talk to me. No matter, Mimi is so much fun to be around. She is in high school and gets to travel on her own, and she blow-dries her honey-colored hair into a flip. After two antsy days of my helping Bubby serve the holiday meals, carrying the trays of food from the kitchen to the sukkah and back, Chol Hamoed is finally here. Mimi comes to pick me up in the morning. I am dressed and ready, having followed her instructions perfectly. Thick tights and a pair of socks on top, a heavy sweater over my shirt to keep me warm, puffy mittens for my hands, and a hat as well. I feel swollen and awkward but well prepared. Mimi is wearing a chic charcoal-colored woolen coat with a velvet collar and velvet gloves, and I am jealous of her elegance. I look like a mismatched monkey, the weight of the mittens dragging my arms down comically. Ice-skating is magical. At first I wobble unsteadily on rented skates, grasping the wall of the rink tightly as I make my way around it, but I get the hang of it very quickly, and once I do, it’s like I’m flying. I push off with each foot and then close my eyes through the smooth glide that follows, keeping my back straight like Mimi said to. I have never felt so free. I can hear the sound of laughter, but it sounds distant, lost in the rush of air whipping past my ears. The sound of skates scraping over the ice is loudest, and I become lost in its rhythm. My motions become repetitive and trancelike and I wish life could be like this all the time. Every time I open my eyes, I expect to be somewhere else. Two hours pass, and I find that I am ravenous. It is a new kind of hunger, perhaps the hunger that comes from delicious exhaustion, and the emptiness inside me, for once, is pleasant. Mimi has packed kosher sandwiches for us. We hunker down on a bench outside the rink to eat them. As I munch enthusiastically on my tuna on rye, I notice a family at the picnic table next to us, specifically a girl who looks my age. Unlike me, she appears suitably dressed for ice-skating, with a much shorter shirt and thick, brightly colored tights. She even has furry earmuffs on. She sees me looking at her and slides off the bench. She holds out a closed palm to me, and when she opens it, there’s candy, in a shiny silver wrapper. I’ve never seen candy like that before. “Are you Jewish?” I ask, to make sure it’s kosher. I take the chocolate from her cautiously. Hershey’s, it says. Hersh is Yiddish for “deer.” It’s also a common Jewish name for boys. The ey tacked on the end makes it an affectionate nickname. I wonder what kind of man Hershey is, if his children are proud of him when they see his name stamped on candy wrappers. If only I were lucky enough to have a father like that. Before I can open the chocolate bar to see what it looks like inside, Mimi looks over with a stern face and shakes her head from side to side in warning. “Thank you,” I say to Stephanie, clenching my fist around the bar until it disappears from sight. She tosses her head and runs back to her table. Mimi takes the chocolate from my hand and drops it into the garbage can next to us. I nod, placated. As I finish my tuna sandwich, I gaze thoughtfully at Stephanie, who is executing jumps on the rubber floor. The serrated front points of her skates make dull thuds each time she lands, her poise perfect. How can you be Jewish and not keep kosher? I wonder. How can you know the aleph-bet but still eat Hershey’s chocolate? Doesn’t she know any better? Aunt Chaya has her most disapproving face on. She’s sitting next to me at the holiday table, teaching me how to eat my soup without slurping. Her glare is frightening enough to provide incentive for a fast, effective lesson. I live in fear of attracting her attention; it’s never positive. Aunt Chaya has always been behind every major decision made about my life, even if I don’t really see her very often anymore. I used to live with her, back when my mother had just left for good, driving off in her little black Honda while everyone on the street poked their heads out the window to witness the spectacle. Perhaps she was the first woman in Williamsburg to drive. I was very unhappy living at my aunt Chaya’s. She would yell at me every time I cried, but the more I tried to stop, the more the tears would fall, betraying me. I begged to come live with Bubby, and even though my grandparents were old and had finished raising their children a long time ago, eventually I was allowed to move back. Zeidy still takes advice from Chaya about how to raise me, and I wonder what makes her the expert, with three daughters who took off their seamed stockings as soon as they graduated from school, and moved to Borough Park after they got married. Before Sukkot, Bubby sent me up to Chaya’s apartment on the fourth floor to help her clean for the holiday. Chaya had laid out mousetraps, because despite twice-weekly visits from the exterminator, we have always had a mouse problem, just like everyone else who lives in an old house in Williamsburg. Chaya always smears extra peanut butter on the sticky yellow trays and slips them under the furniture. When I got there, she was checking all the traps. She steered one out from under the stove with a broom, and there, making pitiful chirping sounds, was a mouse, squirming desperately on the tray. There was no way to remove it once it was stuck, I realized, but still I longed for a more merciful solution, like catching a bug and releasing it on the street. But before I could say a word, Chaya picked up the trap with two hands and folded it in half in one quick, slapping motion between her two palms, instantly crushing the mouse to death. I gaped for a moment. I had never seen anyone get rid of a mouse with such relish. When Bubby found one, it was usually already dead, and she wrapped it in plastic bags and took it down to the garbage can in the front yard. A few months ago I opened one of my dresser drawers and found a family of mice nesting in a folded sweater of mine: nine pink, writhing creatures, each the size of my thumb, skittering happily amidst a hillock of shredded aluminum foil and paper that I supposed their mother had provided. I let them stay for a week without telling anyone of my discovery. One day they were gone. I had, stupidly, just allowed ten more full-grown mice to frolic freely in our house, while Bubby fretted constantly about how to get rid of them. It’s not that I like mice. I just don’t like killing things. Zeidy thinks that compassion like mine is inappropriate, misplaced. It’s like having compassion is a good thing, but I don’t use it right or something. I feel bad for things I shouldn’t feel bad for. I should have more compassion for the people who are trying to raise me, he says. I should work harder to make him proud. All my aunts and uncles are hard on their children, it seems to me. They berate them, embarrass them, and yell at them. This is chinuch, child rearing according to the Torah. It is the parents’ spiritual responsibility that their children grow up to be God-fearing, law-abiding Jews. Therefore, any form of discipline is all right as long as it is for that purpose. Zeidy often reminds me that when he is delivering a harsh lecture to a particular grandchild, it is only out of a sense of obligation. Real anger is forbidden, he says, but one must fake it for the sake of chinuch. In this family, we do not hug and kiss. We do not compliment each other. Instead, we watch each other closely, ever ready to point out someone’s spiritual or physical failing. This, says Chaya, is compassion—compassion for someone’s spiritual welfare. And Chaya has the most compassion for my spiritual welfare of anyone in my family. Whenever she visits Bubby, she watches me like a hawk, pointing out what I’m doing wrong every few minutes. My heart beats quickly when I’m around her; its rhythm thrums loudly through my ears, drowning out the sound of her voice. It’s not that no one else in the family criticizes me. Aunt Rachel is always looking at me like there’s dirt on my face that I forgot to clean off, and Uncle Sinai slaps at my head when I get in his way. But Chaya looks right at me when she talks to me, her mouth hard with something close to anger that I don’t quite understand. She is always dressed in expensive matching suits and shoes, somehow managing to avoid getting wrinkled or dirty even while serving and cleaning up. When I get a fine spray of soup on my collar, she makes a clicking noise with her tongue in disdain. I get the distinct sense that she takes pleasure in the fear she evokes in me; it makes her feel powerful. None of the others seem to notice how I feel about them, but she knows that she frightens me, and she likes it. There are times when she even pretends to be nice, her voice oozing sugary sweetness but the glint in her narrowed, pale blue eyes hinting at something else, asking me if I want to help her bake cherry pie, then scrutinizing me carefully as I knead the pastry dough in the big steel bowl, waiting for the slightest slipup. Chaya is the only true blonde in the family. Although I have two other aunts who wear blond wigs, everyone knows their hair turned ashy long before they were married. Only Chaya has the coloring of a genuine blonde: fair, even-toned skin and eyes the color of blue-tinted ice. It is very rare in Williamsburg for someone to be a natural blond, and I can tell Chaya takes pride in her beauty. Sometimes I squeeze lemon juice on my head and run it through my strands in the hope that they will lighten, but no change is apparent. Once I put Clorox cream on one section, and it worked, but I was worried that people would notice because it looked too obvious. It’s forbidden to dye one’s hair, and I couldn’t have borne the gossip that would have ensued if anyone were suspicious of my new gold streaks. Chaya has convinced Zeidy to let her take me to another psychiatrist. We have already been to two, both of them Orthodox Jews with offices in Borough Park. The first one said I was normal. The second one told Chaya everything I said to him, so I clammed up and refused to talk again, until he gave up. Now Chaya says she will take me to a woman doctor. I understand why I need to see a doctor for crazy people. I expect I may be crazy too. I keep waiting for the day when I will wake up foaming at the mouth like my great-aunt Esther, who is epileptic. After all, Chaya implies that it runs in my mother’s side of the family. Surely, with my unfortunate genetic inheritance, I can hardly hope for mental health. What I don’t understand is, if these doctors can help, why didn’t they send my parents to one? Or if they did, and it didn’t work, why would it work on me? The woman’s name is Shifra. She has a paper with a chart on it that she calls an enneagram. It’s a list of nine different personality types, and she explains to me that you can be one of the nine personality types but still have “wings” in the other personalities, so you can be a five, with four and six wings. How quickly she has put me in a box, within the first ten minutes of our meeting. And is there something so wrong with being an individual, being self-sufficient and private as she says? Is that the neurosis that Chaya wants to drive out of me, so she can make me more like her: rigid, disciplined, and, most of all, conforming? I storm out of the session early. Surely the “doctor” will use this as proof that I am indeed a problem to be solved, a disorderly personality to be rearranged. I walk up and down Sixteenth Avenue, watching the women and girls doing their preparatory shopping for Shabbos. The smell of old herring wafts up from the grimy gutters and I wrinkle my nose. I don’t understand why I can’t be like these other girls, in whom modesty is so ingrained that it runs in their veins. Even their thoughts are still and quiet, I can tell. With me, you can see on my face what I’m thinking. And even if I never speak the thoughts out loud, you can tell that they are forbidden. In fact, I’m having a forbidden thought right now. I’m thinking that I’m not expected back in Williamsburg for another hour and a half, and just a few blocks north is the public library I have passed so many times before. It’s safer for me to sneak in here, in a neighborhood where no one knows me. I don’t have to be so scared of being recognized. In the library, it is so quiet and still that I feel my thoughts expand in the space that the tall ceiling provides. The librarian is arranging a display in the children’s section, which is blessedly empty. I like the children’s section because there are places to sit, and the books are already picked out for me. The librarians always smile when they see me, silent encouragement in their eyes. I don’t have a library card, so I can’t take books home with me. I wish that I could, because I feel so extraordinarily happy and free when I read that I’m convinced it could make everything else in my life bearable, if only I could have books all the time. Sometimes it feels like the authors of these books understand me, that they wrote these stories with me in mind. How else to explain the similarities between me and the characters in Roald Dahl’s tales: unfortunate, precocious children despised and neglected by their shallow families and peers? After I read James and the Giant Peach, I dreamed of rolling away in the womb of a fruit from Bubby’s garden. It seems to me that in the literature revolving around children, children who are strange and misunderstood like me, at some point something comes along to transform their lives, to transport them to the magic netherworld to which they truly belong. And then they realize that their old life was just a mistake, that they were extraordinary all along and meant for bigger and better things. Secretly, I too am waiting to fall down a hole into Wonderland, or pass through the back of a wardrobe into Narnia. What other possibilities could I consider? Surely I will never be at home in this world. I cross my legs in delicious anticipation when I read about Matilda discovering her power in class one day, in that desperate turning moment that every story seems to have, when it is thought that all hope is lost and then suddenly it shows up again, from somewhere unexpected. Will I too one day find that I have a power that has been kept secret from me? Does it lie dormant within me right now? It would make sense then, all of this, if I were like Matilda and I went home with Miss Honey in the end. There is always a happy ending in children’s books. Because I have not yet begun to read adult books, I have come to accept this convention as a fact of life as well. In the physics of imagination, this is the rule: a child can only accept a just world. I waited for a long time for someone to come along and rescue me, just like in the stories. It was a bitter pill to swallow when I realized that no one would ever pick up the glass slipper I left behind. An empty vessel clangs the loudest. That’s the adage I hear continuously, from Chaya, from the teachers at school, from the Yiddish textbooks. The louder a woman, the more likely she is to be spiritually bereft, like the empty bowl that vibrates with a resonant echo. A full container makes no sound; she is packed too densely to ring. There are many proverbs repeated to me throughout my childhood, but this one stings the most. I try, but I can’t help my natural impulse to talk back. It’s not smart, I know, for me to always want to have the last word. It results in a world of trouble that I could easily save myself from, if I could only learn to keep quiet. Yet I cannot allow another’s mistake to pass by unnoticed. I must comment on the grammatical slipups and misquotations of my teachers out of an unexplained duty to the truth. This behavior has branded me a mechitsef, an insolent one. I go to Satmar school now. Chaya decided which class to put me in; she is the principal of the elementary division. The other students were initially jealous of me, assuming I had unlimited grace, but the truth is it’s another opportunity for Chaya to keep tabs on me and report back to my grandparents. She says she put me in the smart class, so that I would feel challenged. There are twelve sixth-grade classes, and each of them is known for a particular trait. The girls in my class are dedicated and studious and don’t understand my desire for excitement. I’m tapping my pencil quietly on my desk as the teacher elaborates on the Torah portion of the week. I simply cannot endure this for hours on end, listening to her drone on in her usual monotone. If only she would care to make it a little more exciting, so I wouldn’t find it so difficult to sit still. Well, if she won’t provide excitement, I will. Two weeks ago someone discovered a dead mouse under the radiator. There was a mad frenzy as everyone tried to leave the classroom at once. The stench was overwhelming. I remember Chaya came down from her office on the fourth floor to see what the commotion was all about. She walked slowly toward the back of the classroom, her square-heeled pumps echoing loudly on the wooden floor, her arms crossed behind her very straight back. She tossed the scarf that covered her short blond wig over her shoulder before bending down to check under the radiator. When she stood back up, there was a withered gray lump dangling from her gloved hand. Beside me, someone choked back a scream. Chaya dropped the dead creature into a Ziploc bag, her lips pursed and eyebrows raised in contempt. Even the teacher looked visibly shaken, her face white. I was the only one who wasn’t speechless with surprise. I cannot explain my aunt. She is not a blood member of my family, and I know very little about her past. All I know is that her children, like her, are strange. They all have the same cold manner, the same rigid posture and attitude. And she is proud of them for that and wants me to be the same. It is as if she thinks that I will never feel pain and so will always be able to perform as is expected of me. Sometimes I think she is right. But I am not prepared to erase the possibility of joy from my existence, and to live like her means to give up on emotion. I am convinced that my ability to feel deeply is what makes me extraordinary, and that is my ticket to Wonderland. Any day now there will be a tincture on my nightstand, with the label Drink Me attached. Until that happens, I am stuck in this classroom. I must come up with a way to make the time pass more quickly. If only another mouse were discovered. As my pencil taps gently on the desk, an idea comes to me like a delicious chill shooting up my spine. What if—no, I couldn’t possibly. But perhaps—no, the risk is too great. To claim to see a mouse where there is none? But if I pulled it off, who could ever point fingers at me? Is it mischief to be startled out of one’s seat by the sight of a mouse skittering across the floor? One could hardly call it premeditated. My limbs tickle now, in nervous anticipation. How would I execute this prank? That’s it—I will drop my pencil. Then, when I bend down to pick it up, I will jump onto my chair, shrieking in horror. I will cry out “Mouse!” and that’s all it will take. In an instant the classroom is alive with screaming as the girls jump onto their desks in an effort to avoid the threatening rodent. Even the teacher looks horrified. She sends the class monitor to get the janitor. Meanwhile there will be no more studying until the janitor has inspected the classroom and pronounced it mouse-free, as I know he will. Still, he interviews me, trying to figure out the mouse’s path, and the possible hole it could have disappeared into, never once appearing to doubt my claim. Is it because he can’t possibly imagine a good Satmar girl concocting such mischief? Or is it because the fear and shock in my face are partly real? Even I am taken aback by my own daring. At recess time, my classmates crowd around me in morbid curiosity, demanding to hear every detail of the sighting. “Your face was so white!” they remark. “You looked truly terrified.” What an actress I am. A white face and trembling hands to go with my scream. To think what I can do with a skill such as this—the ability to convince others of emotions I don’t really feel! It is a thrilling thought. Later, when Bubby and Zeidy hear about the incident from Chaya, they laugh about it. Only Chaya turns to me with a suspicious look in her eye, but she doesn’t say anything. For the first time, I feel triumphant, and I look back at her calmly. This, then, is my power. Perhaps I cannot move things with my mind, like Matilda, but I can pretend; I can act so convincingly that no one will ever be able to discover the truth. Bubby looks up at me from where she is kneading dough for kreplach on the cast-iron tabletop. It’s a humid day, perfect for getting dough to rise. The steam rising from the stove fogs up the rain—splattered windows. My floury fingers leave smudges on the glass bottle of olive oil with its picture of an artfully draped woman snaked around the words extra virgin. “Where did you hear that word?” she asks. I notice her shocked expression and realize I’ve said something bad, so I stutter anxiously in response, “I d-d-don’t know, Bubby, I don’t remember . . .” I turn the olive oil around so that the label is facing the wall. “Well, it’s not a word for little girls to know,” Bubby says, and goes back to rolling the delicate potato-flour dough with her bare hands. Her pink cotton turban is askew, so that the glittering rhinestone set into the knot is over by her right ear, and a thatch of white fuzz is visible. When I’m married, I’m going to wear the fashionable turbans, made out of terry cloth and piled elegantly into a square knot on top of my head, and my neck will be shaved clean, even though Bubby says her neck itches all the time when it’s shaved closely. It was nothing in the end, she says. Sometimes it sounds like she is trying to convince herself and not just me. Bubby hesitates for a moment before answering. “Zeidy tells me that the rebbe wants us to be more ehrlich, more devout, than any Jew ever was. He says that if we go to extreme lengths to make God proud of us, he’ll never hurt us again, like he did in the war.” And here she always falls silent, sinking into reminiscent misery. I look at Bubby now, bent over her ever-present work, and watch as she adjusts her turban with a floury hand, leaving a white streak on her forehead. She begins cutting squares out of the flattened sheet of kreplach dough and fills them with farmer cheese, then folds the squares in half to form triangular pockets. I drop the kreplach into a pot of boiling water on the stove, watching them jostle each other for space at the top. I wish I could take back my question, or at least say a gut vurt to Bubby, something that will reassure her that I’m a good girl who doesn’t use bad words. All I ever have are questions, though. “Oy vey,” Bubby says with a sigh when I start asking questions, “why do you always need to know everything?” I don’t know why, but it’s true, I just need to know. I want to know about that book she keeps hidden in her underwear drawer, the cheap paperback with the pouty woman on the cover, but I know it’s hidden for a reason, that it’s a secret, and I have to keep it. I have secrets too. Maybe Bubby knows about them, but she won’t say anything about mine if I don’t say anything about hers. Or perhaps I have only imagined her complicity; there is a chance this agreement is only one-sided. Would Bubby tattle on me? I hide my books under the bed, and she hides hers in her lingerie, and once a year when Zeidy inspects the house for Passover, poking through our things, we hover anxiously, terrified of being found out. Zeidy even rifles through my underwear drawer. Only when I tell him that this is my private female stuff does he desist, unwilling to violate a woman’s privacy, and move on to my grandmother’s wardrobe. She is as defensive as I am when he rummages through her lingerie. We both know that our small stash of secular books would shock my grandfather more than a pile of chametz, the forbidden leavening, ever could. Bubby might get away with a scolding, but I would not be spared the full extent of my grandfather’s wrath. When my zeide gets angry, his long white beard seems to lift up and spread around his face like a fiery flame. I wither instantly in the heat of his scorn. “Der tumeneh shprach!” he thunders at me when he overhears me speaking to my cousins in English. An impure language, Zeidy says, acts like a poison to the soul. Reading an English book is even worse; it leaves my soul vulnerable, a welcome mat put out for the devil. I’m not myself today, which explains my slip of the tongue. There’s something new under my mattress this week, and soon (when Bubby doesn’t need my help with the kreplach) I will shut the door to my room and retrieve it, the wonderful leather-bound volume with its heady new-book smell. It’s a section of the Talmud, with the forbidden English translation, and it’s thousands of pages long, so it holds the promise of weeks of titillating reading. I can’t believe I will finally be able to decode ancient Talmudic discourse designed specifically to keep out ignoramuses like me. Zeidy won’t let me read the Hebrew books he keeps locked in his closet: they are only for men, he says; girls belong in the kitchen. But I’m so curious about his learning, and what exactly is written in the books he spends so many hours bent over, quivering with scholarly ecstasy. The few bits of watered-down wisdom my teachers supply in school only make me hunger for more. I want to know the truth about Rachel, Rabbi Akiva’s wife, who tended her home in poverty for twelve years while her husband studied Torah in some foreign land. How could the spoiled daughter of a rich man possibly resign herself to such misery? My teachers say she was a saint, but it has to be more complicated than that. Why would she marry a poor, ignorant man like Akiva in the first place? It couldn’t be that he was good-looking, because then she wouldn’t agree to his twelve-year trip. There has to be a reason, and if no one will tell me, then it’s my job to find out. I purchased the Schottenstein translation of the Talmud last week at the Judaica store in Borough Park. The small shop was empty, lit only by the weak strands of sunlight filtering in through the grimy windows. The silver dust bunnies seemed suspended in the beams of light, floating slowly upward with the force of a weak draft from a heating vent. I hid in the shadows of the staggering bookshelves as I mumbled to the bookseller that the book was for my cousin, that I had been asked to purchase it. I wondered if my nervousness was evident; surely my deception was written on my forehead, just as Zeidy always warned me it would be. “Der emes shteit oif di shteren,” Zeidy says. “No matter how convincingly you lie, your forehead gives you away.” I imagine words etched into my skin, glowing like neon in the dark, my lanky brown bangs swept upward by a sudden breeze. There is only one man ever working in that tiny bookstore on New Utrecht Avenue, as I have gleaned from the many reconnaissance trips I have made. He is old, with shaky hands and eyes that blink unsteadily, and as he wrapped the large, ungainly book in brown paper, I couldn’t quite believe I’d gotten away with it. Maybe this man couldn’t read foreheads, or I had succeeded in looking stupid, keeping my eyes flat and lifeless. He took my sixty dollars, most of it in singles and earned from babysitting jobs, counting it slowly before nodding his head. “It’s gut,” he said: I could go. I tried to exit the shop nonchalantly, and it was only once I was all the way down the block that I started skipping in uncontained joy. The illicit thrill of what I had just done made my knees tremble on the bus ride home to Williamsburg. Surely anyone could see the mischief I had been up to. The men sat in the front section of the bus, thankfully turned safely away from me, but the women with their kerchief-wrapped heads and thick stockings seemed to stare accusingly at me and the hefty parcel in my lap. Walking down Penn Street, I clutched the brown paper package to my chest, my legs jerky and electrified by a mixture of fear and triumph. I avoided the gaze of passersby, terrified of running into a suspicious neighbor. What if someone asked me what I was carrying? I skirted young boys careening by on shabby bicycles and teenagers pushing their younger siblings in squeaky-wheeled prams. Everyone was outside on this balmy spring day, and the last half block seemed to take forever. At home I rushed to hide the book under my mattress, pushing it all the way in just in case. I smoothed the sheets and blankets and draped the bedspread so that it hung to the floor. I sat down at the edge of the bed and felt guilt wash over me so suddenly that the strength of it kept me pinned there. I wanted to forget that this day had ever happened. All through Shabbos the book burned beneath my mattress, alternately chastising me and beckoning to me. I ignored the call; it was too dangerous, there were too many people around. What would Zeidy say if he knew? Even Bubby would be horrified, I knew. Sunday stretches ahead of me like an unopened krepela, a soft, doughy day encapsulating a secret filling. All I have to do is help Bubby with the cooking, then I will have the rest of the afternoon free to spend as I please. Bubby and Zeidy have been invited to a cousin’s bar mitzvah today, which means I will have at least three hours of uninterrupted privacy. There is still a slab of chocolate cake in the freezer that I’m sure Bubby, with her spotty memory, won’t miss. Could this afternoon get any better? After Zeidy’s heavy footfalls fade down the stairs, and I watch from my second-floor bedroom window as my grandparents get into the taxi, I slide the book out from under the mattress and place it reverently on my desk. The pages are made of waxy, translucent paper, and they are each packed with text: the original words of the Talmud as well as the English translation, and the rabbinical discourse that fills up the bottom half of each page. I like the discussions best, records of the conversations the ancient rabbis held about each holy phrase in the Talmud. On the sixty-fifth page the rabbis are arguing about King David and his ill-gotten wife Bathsheba, a mysterious biblical tale about which I’ve always been curious. From the fragments mentioned, it appears that Bathsheba was already married when David laid his eyes upon her, but he was so attracted to her that he deliberately sent her husband, Uriah, to the front lines so that he would be killed in war, leaving Bathsheba free to remarry. Afterward, when David had finally taken poor Bathsheba as his lawful wife, he looked into her eyes and saw in the mirror of her pupils the face of his own sin and was repulsed. After that, David refused to see Bathsheba again, and she lived the rest of her life in the king’s harem, ignored and forgotten. I now see why I’m not allowed to read the Talmud. My teachers have always told me, “David had no sins. David was a saint. It is forbidden to cast aspersions on God’s beloved son and anointed leader.” Is this the same illustrious ancestor the Talmud is referring to? Not only did David cavort with his many wives, but he had unmarried female companions as well, I discover. They are called concubines. I whisper aloud this new word, con-cu-bine, and it doesn’t sound illicit, the way it should, it only makes me think of a tall, stately tree. The concubine tree. I picture beautiful women dangling from its branches. Con-cu-bine. Bathsheba wasn’t a concubine because David honored her by taking her as his wife, but the Talmud says she was the only woman David chose who wasn’t a virgin. I think of the beautiful woman on the olive oil bottle, the extra-virgin. The rabbis say that God only intended virgins for David and that his holiness would have been defiled had he stayed with Bathsheba, who had already been married. King David is the yardstick, they say, against whom we are all measured in heaven. Really, how bad can my small stash of English books be, next to concubines? I am not aware at this moment that I have lost my innocence. I will realize it many years later. One day I will look back and understand that just as there was a moment in my life when I realized where my power lay, there was also a specific moment when I stopped believing in authority just for its own sake and started coming to my own conclusions about the world I lived in. At the time, the problem with losing my innocence was that it made it difficult to keep pretending. Inside me a conflict was brewing madly between my own thoughts and the teachings I was absorbing. Occasionally this tension would boil over my smooth facade, and others would try to remove me from the flames of curiosity before I went too far. I don’t hear the alarm go off on Monday morning, and when I finally wake up, it’s 8:40 and I don’t have time to do anything but get dressed and fly out the door. I pull on the thick black stockings that Bubby washed yesterday and dried on the porch clothesline; the fabric is stiff and cold from the chilly autumn air and won’t conform to my legs, wrinkling unattractively around my knees and ankles. In the bathroom I peer into the cracked mirror under the light of a fluorescent bulb and poke at the blackheads on my nose. My hair is squashed and limp, my eyes storm gray beneath swollen eyelids. I’ve forgotten to put a shirt on beneath my sweater. There’s a new rule about no knits directly on the body. Now that we are growing up, my teachers say, we have to be careful to avoid clingy fabrics. I could get in trouble, but it’s ten minutes to nine and if I leave now, I will make it just in time to be let into the cafeteria for morning prayers. I can’t afford to be late today; I already have too many demerits stacked against me. Forget the blouse. I race into school just as the junior secretary is about to close the door to the prayer room. She sighs when she sees me, and I know she can’t decide whether to let me in or make me wait in the principal’s office for a late note. I squeeze past her through the half-open door with a sheepish smile. “Thanks,” I say breathlessly, ignoring her scowl. Downstairs an eighth grader has already been chosen to lead the prayer session. I slide quickly into one of the empty spots in the back rows, next to Raizy, who is still running a comb through her knotted brown hair. I keep my eyes down, in the general direction of the prayer book on my lap, but unfocused, so that the words are blurred on the page. I move my lips to look like I’m praying when the senior secretary walks down the aisle, checking to see if we are all following along. Raizy slips the comb underneath a page in her prayer book and chants loudly along with the others. We are praying to the God of our people, whom we call Hashem, literally, “the Name.” The true name for God is devastatingly holy and evocative; to utter it would represent a death wish, so we have safe nicknames for him instead: the Holy Name, the One, the Only, the Creator, the Destroyer, the Overseer, the King of All Kings, the One True Judge, the Merciful Father, Master of the Universe, O Great Architect, a long list of names for all his attributes. For the sake of this divinity I must surrender myself each morning, body and soul; for this God, my teachers say, I must learn silence so that only his voice can be heard through me. God lives in my soul, and I must spend my life scrubbing my soul clean of any trace of sin so that it deserves to host his presence. Repentance is a daily chore; at each morning prayer session we repent in advance for the sins we will commit that day. I look around at the others, who must sincerely believe in their inherent evil, as they are shamelessly crying and wailing to God to help them expunge the yetzer hara, or evil inclination, from their consciousness. Although I talk to God, it is not through prayer. I talk to him in my mind, and even I will admit that I do not come to God humbly, as I should. I talk to him frankly, as I would to a friend, and I’m constantly asking him for favors. Still, I feel like God and I are on pretty good terms, relatively speaking. This morning, as everyone sways passionately around me, I stand calmly in the sea of young girls, asking God to make this day a bearable one. I’m very easy to pick on. The teachers know I’m not important, that no one will defend me. I’m not a rabbi’s daughter, so when they get angry, I’m the perfect scapegoat. I make sure never to look up from my siddur during prayer, but Chavie Halberstam, the rabbi’s daughter, can elbow her friend Elky to point out the toilet paper stuck to the teacher’s shoe and it’s as if nothing happened. If I so much as smirk, I’m singled out immediately. This is why I need God on my side; I have no one else to stick up for me. The minute I walk into my fourth-floor classroom this morning, I’m accosted by Mrs. Meizlish, our Yiddish teacher. Her unibrow is knitted in anger. I call her Mrs. Meizel, or Mrs. Mouse, behind her back. I can’t help it; her name practically begs to be made fun of, and there’s something about the way her upper lip lifts over her two front teeth that makes her look genuinely ratlike. She doesn’t like me very much. I back away slowly, half glad at being banished. If I’m lucky, the principal will be busy all morning, and I will get to sit in her office instead of bungling through Yiddish period. It’s a fair trade-off. Sure, I’ll get a yelling; maybe I will even get sent home to change. If Zeidy isn’t home, I could while away most of the afternoon in the name of “changing.” Perhaps finish this new book I’m reading, about an Indian girl who falls in love with an American colonist in the seventeenth century. But there’s always a chance he could be at the house. Then he will want to know why I was sent home from school, and I can’t bear the look of crushed disappointment on his face when he finds out I’m not the model student he wants me to be. “Nu, Devoireh,” he groans pleadingly. “You can’t be a good girl for your zeide, so I can have a little nachas, a little pride, from you?” His Yiddish is heavy and European-accented and has an ever-present wrenchingly sad rhythm that makes me feel old and tired whenever I hear it. Maybe I shouldn’t ask this of God, this wish to be sent home to change just to avoid a couple of hours of school, not if there’s a chance I might have to sit down to a lecture about obedience and honor at the dining room table. I hear footsteps out front, and I straighten up quickly as the principal heaves her considerable bulk into the office, red-faced with the effort. I finish up that last round of the psalm in my head: “I will sing unto Hashem, because he has dealt bountifully with me.” It takes her a few minutes to get settled into the enormous armchair behind her desk, her breathing loud and labored even after she has been seated. I smile sheepishly. It’s not my first time in this office. I don’t answer. I’m not supposed to answer. All her questions are rhetorical; I know that from experience. I’m just supposed to sit quietly with my head down and my expression humble and contrite, and wait it out. After a few moments, she’ll wind down and become more affable, looking for a compromise. I can tell she’s tired of having to discipline me. She’s not one of those principals who enjoy the thrill of the chase, like the one who used to make me stand outside her office for hours in the sixth grade. I slip out of her office gratefully and take the four flights of stairs two at a time. The moment when the spring sunshine hits my face is like the taste of Zeidy’s kiddush wine, my first breath of fresh air a long, slow tingle down my throat. At the intersection of Marcy Avenue and Hooper Street, I cross over to the other side without even thinking about it, to avoid the massive Catholic church that graces the corner. I keep my eyes averted from the seductive statues staring at me through the gated enclosure. To look directly at the church grounds is to look at evil, Bubby says when we pass this corner; it’s an open invitation to Satan. I cross back over at Hewes Street, quickening my pace because I can feel the eyes on my back, and I picture the stone figures coming to life, lumbering down Marcy Avenue, shattering a little with every step. I hug my arms, rubbing them to get the goose bumps to go down. In my rush I almost collide with a man walking in the other direction, mumbling prayers to himself, his earlocks swinging. I have to step awkwardly into the gutter to avoid him. Funny, I notice suddenly, there are no other women on the street. I’ve never been on the street at this time of day before, when all the girls are in school and mothers are busy cleaning house and preparing dinner. Williamsburg seems hollow and empty. I quicken my pace, jumping over the puddles of dirty water shopkeepers spill out into the street. The only sound is the harsh echo of my own staccato footsteps on the cracked asphalt. I take a left turn on Penn Street, passing Mr. Mayer’s grocery on the corner, and leap up the steps to my brownstone home. Pushing open the heavy double doors, I listen for any sound but hear none. I close the doors gently just in case. My shoes make faint clicking noises as I climb the staircase, but if Zeidy is in his office downstairs, he doesn’t hear them. I take the key from under the doormat that Bubby leaves for me when she goes away, and sure enough, the lights are off and the house is quiet and still. I change quickly, buttoning a long-sleeved blue oxford shirt all the way to the top so that the collar is tight against my neck. I put the sweater back on over the shirt and pull out the two collar points so that they rest neatly on the navy blue wool, and I turn twice before the mirror, checking to see if I’m tucked in on all sides. I look like a fine girl, just like Zeidy wants me to be, just like teachers always call Chavie, the rabbi’s daughter. Fine, like expensive fabric, like good china, like wine. I hurry back through the empty streets to school. The men shuffle home from their learning sessions to eat the lunch their wives have prepared, dodging me on the sidewalk, making a show of looking the other way. I want to shrink into myself. Inside the school building I expand in relief. From the safe vantage of my classroom I gaze out the window overlooking Marcy Avenue and marvel anew at the absence of color and life down below, in stark contrast to the buzzing of a thousand girls pent up in this square-block, five-story building. Occasionally a young man, dressed all in black, straggles up Marcy Avenue toward the Satmar shul on Rodney Street, hands swirling through the payos dangling near each cheek, keeping them curled into neat spirals. The older men wear their payos wound tightly around their ears and use their hands instead to smooth down their prolific beards, even as they are buffeted like flags in the wind. All of them walk quickly, heads down. Snap. Mrs. Meizlish flicks her thumb and forefinger loudly under my nose. I start. “Why aren’t you looking in?” she asks sternly. I shuffle nervously through the loose-leaf binder on my desk, looking for the appropriate stencil. Mrs. Meizlish has the whole class looking at me now, making a show of waiting for me to get myself together. I can feel my cheeks redden. I think we are studying berachos now, and I know I have the “Guide to Proper Blessings” somewhere in here. I make a show of finding the right place, and Mrs. Meizlish gives me the barest nod of approval. “Which blessing for strawberries?” Mrs. Meizlish, still standing in front of my desk, asks in the special Yiddish singsong. “Bo-rei pri ha’ad-am-ah,” the class sings back in unison. I whisper along halfheartedly so that she can hear me, hoping she’ll move back to the center of the classroom so I don’t have to stare up at her chin, covered in a wash of black baby hairs. After recess, it’s time for the daily modesty lecture. Mrs. Meizlish continues where we left off in the story of Rachel, Rabbi Akiva’s saintly wife, and the rest of the class stares raptly at her. She has a good way of telling a story, Mrs. Meizlish, with her thick baritone that she modulates into an erratic rhythm that never quite lets you get comfortable. She always pauses at the best parts of the story to smooth a few stray hairs into her braid or pick an invisible piece of lint off her skirt, while the suspense builds and the girls gape anxiously at her. Not only was Rachel, wife of Akiva, a truly righteous woman, but she was also an exceptionally modest person, to the point where—and here Mrs. Meizlish pauses for effect—she once stuck pins into her calves to keep her skirt from lifting in the breeze and exposing her kneecaps. I cringe when I hear that. I can’t stop picturing the punctured calves of a woman, and in my mind the pricking takes place over and over again, each time drawing more blood, tearing muscle, gashing skin. Is that really what God wanted of Rachel? For her to mutilate herself so that no one could catch a glimpse of her knees? When the bell rings to signal final dismissal, I have my book bag packed and ready, jacket in hand. I hurry out of class the second the teacher gives us the signal, hoping to make it at least to the second floor before the staircases become choked by the crowds. Sure enough, I race down the first two flights but come to a short stop as I round the corner to the second floor, where groups of chattering students squeeze through the doorways, pushing and shoving through the crush on the staircase. I’m forced to take it one slow step at a time, as I wait for the other girls, who are in no rush, to move. It seems to take forever to descend those last two flights, and I feel as if I am holding my breath, until I finally burst out of the stairway on the first floor, zigzagging through clusters of first graders to get to the exit. I cut a straight path through the front yard with its high brick walls topped with loops of barbed wire, gallop down the wide stone steps, and spare only one last glance at the headless gargoyles jutting from the turrets of the crumbling stone building. The new spring air thrills me as I run, shoes slapping loudly on the pavement, down Marcy Avenue, leaving the slow-moving crowd behind me, racing to be the first one home. The streets are full, swollen with schoolgirls in pleated skirts spilling over into the grimy gutters. Cars honk as they drive slowly past. I feel my shirt collar digging into my neck, and I open the top button and shake the collar loose, inhaling deeply. There are no men to be found, not now, not at this hour, when the street belongs to me, and to me alone.